Pedersen Farms is located in Seneca Castle, NY. 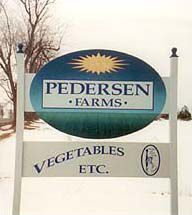 Rick and Laura Pedersen began Pedersen Farms in 1983. They currently have over 600 acres certified organic and are a member of Finger Lakes Organics (FLO), supplying restaurants and grocery stores in New York City and upstate New York. Advocates of land stewardship, they grow a variety of vegetables and hops in an environmentally responsible way. We source a number of items from them, including asparagus, edamame beans, and cauliflower.